Exit the King by Eugene Ionesco, directed by Neil Armfield. Designed by Dale Ferguson, lighting by Damien Cooper, composer John Rodgers, sound design Russell Goldsmith. With Billie Brown, Julie Forsythe, Gillian Jones, Rebecca Massey, Geoffrey Rush, David Woods, music by Scott Tinkler. Merlyn @ the Malthouse until April 21. Like Samuel Beckett, Eugene Ionesco is aging well. As the years roll on, he just looks more and more hip. While contemporaries like John Osborne or Arthur Miller have gained a tinge of sepia, the mark of the "classic" that is an expression of its time and must be seen through a lens of metaphor in order to reflect ours, Ionesco sparkles with contemporary bite: he took a short cut and made a metaphor in the first place. He was never concerned with the social applicability of his work, and directed his intelligence towards very simple things - death and loneliness, mainly - writing about them with a directness and clarity that, paradoxically, gave him a reputation as a fiercely difficult playwright. When my lieutenant and my boss are back in their homes, alone in their rooms, they could, for example, just like me, being outside the social order, be afraid of death as I am, have the same dreams and nightmares, and having stripped off their social personality, suddenly find themselves naked, like a body stretched out on the sand, amazed to be there and amazed at their own amazement, amazed at their own awareness as they are confronted with the immense ocean of the infinite, alone in the brilliant, inconceivable and indisputable sunlight of existence. And it is then that my general or my boss can be identified with me. It is in our solitude that we can all be reunited. As the brutal history of the 20th century collapsed the categories of right and left ideologies into a maze of contradictory mirrors, it began to look rather as if Ionesco's dark but surprisingly joyous vision might have been more prescient than it was allowed in his time. His sceptical humanity is bracing when the possibility of belief seems to be decaying into a kind of mediaevalism, and when the pressures of modernity have made the self uniquely atomised and lonely. Certainly, Exit the King - which charts the gradual death of a monarch who has reigned past his allotted time - has lines that bite deeply into the political present. But the play is ultimately a lament for human mortality, all the more poignant for its pitiless and anarchic comedy. 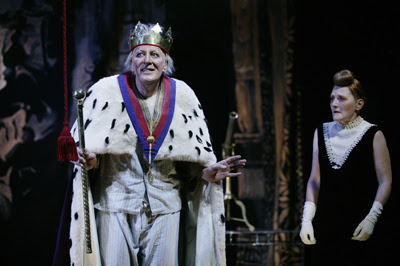 Berenger, the King (Geoffrey Rush) is a parodic portrayal of the ultimate patriarch. He has seen better days: his demesne once extended over 9000 million people, but now he rules over less than a thousand prematurely-aged subjects, and what is left of his kingdom keeps falling into an abyss. His court is reduced to a shabby retinue: there's the domestic help Juliette (Julie Forsythe), who also fulfils the functions of nurse, cook and general dogsbody, the Guard (David Woods) and the Doctor (Billie Brown), who is also the astrologist and executioner, and his two rival queens, Marie (Rebecca Massey) and Margeurite (Gillian Jones). As we are informed, the King must die by the end of the play. The play itself is simply a matter of getting there, as Berenger howls against his fate, moving from denial to terror to pathos to a final, moving acceptance. Ionesco has literalised the tyranny of the ego, which at the point of death refuses to contemplate its own annihilation, and will give anything - even the destruction of the entire world - if only it can go on living. But even the King, who once, we are given to believe, could command the sun itself, has to bow before death. It's fair to say that I went to this production with high expectations. Not only is it a wonderful play with passages of breathtakingly beautiful writing, but Armfield's production features a cast of such depth and talent that it sizzles on the page. It could have become a star vehicle for Rush - and he is, after all, a genuine star - but Armfield has wisely ensured that his production is more than a frame for Rush's performance. Still, I was looking forward to seeing Rush on stage again. I've seen him in some remarkable roles. Neil Armfield's 1989 production of Gogol's Diary of a Madman, with Geoffrey Rush as Poprishchin, the obsequious clerk whose banal life slides into pitiable madness, was one of the great moments in Australian theatre. Rush's wonky entrance on stage, teetering beneath improbably high carrot-red hair, is one of my cherished theatrical memories. Equally memorable was his performance as Khlestakov in The Government Inspector at the Sydney Opera House, again under Armfield's direction, in a carnivalesque production that seemed to include half of the stand-up comics in Sydney. He also made a wickedly good John Worthing in Simon Phillips' justly celebrated production of Wilde's The Importance of Being Earnest. That was, of course, before he became hugely famous, when he was simply the best comic stage actor in Australia. In Exit the King, he makes a triumphant return to his natural element. Rush is the brilliant centre of a sparkling ensemble: after a slightly sticky twenty minutes or so at the beginning of the play, his performance is as remarkable as any I've seen. Rush is a great clown, and this role gives him plenty of scope for physical humour, especially in a scene in which (as the Guard announces) "The King is Marching!" But his skill is evident in his restraint; he never allows grotesquerie to degenerate into mere cartooning. Like Ionesco's writing, he keeps his options open: anything is possible at any time. He plays the full range of the text, from broad comedy to brutality to sheer pathos, until he becomes the everyking we all are, alone and afraid in our shabby kingdoms, facing the dark. Rush is surrounded by some excellent performances, and each actor has his or her moment of virtuosic display. David Woods, whom I last saw in the Ridiculusmus production of The Importance of Being Earnest, is another accomplished clown, clanking around the set in his armour and announcing every petty detail of the action. Billie Brown as the Doctor, the avatar of death or fate, is a model of obsequious tyranny, and Julie Forsythe, who has possibly the most ridiculous hairstyle I've seen, is at her comedic best as the harrassed and resigned maid Juliette. Rebecca Massey as Queen Marie, the symbol of sensuous pleasure, trembles with a kind of luminous courage in the midst of her melodramatic excesses. Gillian Jones' performance as Marguerite, the first wife who reminds him of his unpleasant duty to die, is quite fascinating. At first I was a little puzzled, as she seemed strangely monotonal (if satisfactorily regal), but by the end of the play I was completely bewitched. In the final scene of Exit the King, Ionesco reverses the perception of death, which we generally see as a departure from the world. The King is, after all, the subject of this play, in every sense of that word, and it is not the King who departs, but everything else. The vanishing of Berenger's world and his entrance into death is accompanied by a hypnotic monologue from Marguerite in which she conducts him through the process of relinquishment, towards the landscape of death. The writing recalls Rilke's Tenth Duino Elegy or perhaps aspects of Dante's Comedy, but it is, in its final refusal of illusion, all Ionesco's own. The last ten minutes or so of this production is, quite simply, astounding theatre, the kind that makes you hold your breath and reminds you why you persist with this beautiful, frustrating artform, so apt to failure and disappointment. Theatre can summon a joy that's like anguish, an exhilaration at once ephemeral and unforgettable, that you can find nowhere else. Regretably, despite Rush's fine acting, I found the theme so repetitive as to be tedious after the first 15 or 20 minutes. Like everyone else I am extremely interested in death - specially my own but this play develops so slowly as to be almost static. needing to make the most of whatever life I have left I had no hesitation in leaving at interval! Hi Anon - what a shame! I do think you missed out. I guess we'll just have to agree to differ on Ionesco; the pleasure is, I guess, not in the "development" or action as such - after all, we know early exactly what is going to happen - but in the details of how that action unfolds. Geoffrey Rush was indeed wonderful, but the production was almost unendurably marred by the two actors playing the queens, neither of whom knew how to use her voice – this was a major handicap in a play that relies largely on speech rather than action. The final scene in particular, which is a kind of pas de deux between the King's actions and the Queen's words, achieved a mere fraction of its potential because the Queen's voice was totally inadequate for the task. It is interesting to note none of the actors in the play mentioned training in the extensive biographies they submitted for inclusion in the program: too many Australian actors do not seem to have paid any attention to developing their vocal skills, despite the fact the voice is the actor's principal means of communication. It's a bit like a violinist not perfecting their bowing. So as Alison says it was great to see Geoffrey Rush at work, but I winced during the climax because it should have been so much better. And part of the blame for this must be on the shoulders of Director Neil Armfield who should have either got the actor in question up to scratch, or cast someone else who could do what was needed. I was (as the review indicates) rather bewitched by Marguerite's voice at the end, though I did have problems at the beginning. And perhaps that first 20 minutes or so is under-directed (I understand it's still quite slow, I thought that it might warm up as the season went on). I don't think I'm being harsh, I'm just pointing out an endemic problem in Australian acting - not enough attention to the voice. Of course most of our top actors - the Rushes, Blachetts, Crows, etc - know what to do with their voices. But at the next level down there is too much hit and miss. Case in point: William McInnes. He's a very good actor on film and television, but I recently listened to his taped reading of Tim Winton's Dirt Music and I was surprised to find that on more than one occassion his intonation and phrasing let him down. It's a matter of getting full value from the words, which is what actors are paid for, after all. Go to any Bell Shakespeare production and you'll find 50% of the cast , whatever the other virtues of their performances, do not get full value out of the words. You would not find this in a RSC performance. And before you jump to any false assumptions, I don't mean Received English diction. You can talk broad Australian and still use your voice in such a way as to make every syllable count. I suppose there is a sort of continuum from your course amateur actor up to your Geoffrey Rushes and Bill Nighys, and what I am saying is that too many Australian actors, even well-respected ones, fall on the low side of the continuum with respect to their voices. I think this is uncontrovertible and obvious to anyone who spends any time in Australian theatres. The question of the miking of the voices inExit the King is another thing again - don't get me started. At the same time, there's a quality in many Australian actors that I really like, which I link with certain qualities in the Australian writing I consider exciting. (I should say that there's an awful lot of Australian writing that doesn't excite me at all, so don't take this as a nationalistic defence...) It's a certain vitality and clarity, an intelligent sense of freedom and directness, a lack of embarrassment about passion, that is not bound down by or directed by a powerful received culture. (This quality is sometimes hijacked as the famous "larrikin" stereotype, but I actually don't mean that, which is all a bit of a cliche, and certainly all a bit male.) I really only perceived this quality when I spent time overseas; and it's what attracts me about Australian acting too. A PS - it also depends what we're both looking at, I guess; and maybe a version of Wilde's gutter and stars thing is happening here. I've avoided Bell Shakespeare for quite a while - you can see why here - and agree with what you say there, although I guess I'll go and see Macbeth when it comes here, being obliged now and ever hopeful... so far as Gillian Jones' Marguerite goes, that monotonal delivery surely was a directorial decision, and was ultimately - for me - stunningly effective, although until then I couldn't see the point. That end sequence was also where the miking paid off for me. (I guess we can argue about whether the end point was worth it.) But I've seen Jones in other plays where she has done very different performances exploiting a much fuller range of vocal ability. I whole-heartedly agree with Jeremy and, as recently as my trip to The Stables here in Sydney, I have found inaudability a major distraction. When I studied with tutors from the RSC in London, we did voice classes. I thought we'd rock along and show-off. But no. We would get to speak maybe one or two words from a monologue before being stopped. Tension in the jaw? To cut a long story short, it was a full week before we even spoke a sentence of one of these wondrous monologues. And when, 8 weeks later, we finally presented our monologues, I could not believe the difference. My face hurt. Every vowel and every consonant is sacred. So is the silence before, after and sometimes between every word. The training in Australia is, by and large, impossible to compare to Europe and the UK, because, sadly for most Australian actors, it's almost like preparing for a marathon they are never going to get to run. Thankyou all for this discussion. I haven’t seen Exit the King yet. Jeremy and Geoffrey, I think it is very misleading to say that only the lucky few actors are sufficiently attentive to voice. Or to so hastily attribute calibre. Though the lights dim very rapidly, there are thousands of well-trained, talented and experienced actors who practise irregularly at best. The actors lucky enough to enter the business, trained and untrained, are very quickly exposed to the generosity of colleagues of all ages, (which means the exposure to experience that accounts for ‘on the job training’) and to the irregularity of meaningful work. I’m aware that the picture is already contradictory, but that’s the way it seems to work. Every theatre company in this hostile climate has to compromise a great deal. It seems to me to be impossible for almost all of Australia’s funded theatre companies to offer ongoing professional training for actors. And most theatre happens outside these companies, ever more remote from resources. Even where such training is newly in place, the existing culture of desperation that theatres inherit makes for slow progress. The enforced attitude is that professional training is an extravagance. The broader attitude is that theatre companies shouldn’t be acting schools. Again we must use analogy to describe our work. Though there is no prize for winning, you can no sooner expect excellence from a company of untrained actors as from untrained footballers. And I don’t mean three years of tertiary training. An actor’s career is life-long and the instrument changes. Technique for voice relates to the exercise of measuring breath and language, and to an awareness of vocal support and physical tension. Technique is only possible through sustained practice. However, there is a limit to what can be sought in technique itself, technique is to voice like rhetorical principles are to vision. If actors cant expect guiding principles that pierce far beyond the commercial, then they will rely increasingly on themselves. Because any company of actors has to work as a team, is as fragile and robust as any team, and cannot survive without leadership and support, we see the double edged sword. I think the context is a particular struggle for dialogue between two hard places violently arriving: the future and the past, and is more than enough for a little tension in the jaw. The question should be what are we hearing exactly? hey my name is Rach. Im going to see 'Exit the King' as a drama excursion. We're doing absurdist thearte currently so i guess this performance came to Sydney at an opportune time. The other plays we have studied (including waiting for goddo)have included certain aspects of absurdist theatre like minimalist dialogue, masks and incongruous lighting. As i will have to study these techniques i was wondering what sort of these absurdist techniques are included in the performance? For an example i recently went to a performance of "Stories in the Dark" which used change in temperature to aid the mood and suspension of the performance. I hope you enjoy the show - I really did. No masks, lush lighting and a great big set, so it's hardly minimalist: it's absurdist through exaggeration, I guess. Very theatrical. All my blog readers are bored to tears with hearing about The Novel, but the good news is that it's well on the way! I have tickets for "Exit the King" at Belvoir in several weeks time. I'm a rank amateur when it comes to theatre, but it is my favorite art form (apart from football, perhaps). Since I know nothing about Ionesco, I was googling and stumbled onto your blog. Whilst I'm theatrically naive, I'm definitely a Webbie, and have much experience of the ways in which this medium works. So congrats - yours is one of the most interesting and informative blogs I've tripped over. One of the 'advantages' of being less than 100% wrapped up in theatre is, I suspect, that it's much easier to judge plays on their overall effect, visually, intellectuallly and emotionally. Call it the old "I know what I like" yardstick perhaps. My googling leaves me wondering... will Armfield let his brilliant cast and the words of Ionesco speak for themselves, or will he meddle and add his own philosophical and political overtones? Do I care??? Probably only a little. I suspect (from my Websearch) that I'll be entralled and moved, and perhaps (but hopefullly not) just a tad irritated. BTW - apart from the joys and irritations of Belvoir, may I give a bouquet to Black Swan, on balance the best theatre company I've experienced over the past several years. Hi there kywong - I think you're fairly safe with Ionesco, he's hard to swing into any narrow ideology. I hope you enjoy it! And keep up the theatre addiction - the theatre needs YOU! I presume, Anon, you're talking about the Broadway production? And can God really give you your money back? Is theis the first review of the Broadway production? Does this mean NYC will treat Belvoir's production the same way London treated Andrew Upton's "Riflemind?" Hi Phillip H - it hasn't officially opened yet. This will be a response to the previews, I expect. It'll be fascinating to see how it is received, although they'll be seeing a totally different cast aside from Rush - Susan Sarandon, eg. And no doubt a different kind of production.